Should You Give Your Dog Peanut Butter? Peanut Butter is an ingredient that is almost synonymous with dogs. It is found in commercial dog treats, dog medicine and of course, homemade dog treats. But what is really "in" peanut butter? How about ... partially and fully hydrogenate vegetable oils, sugar, salt, and according to one peanut butter ingredient list, may contain traces of milk, eggs, anchovies, wheat and soy. I don't know about you, but that's not what I'd like to have when I sit down for a peanut butter snack. So, why would you want to make homemade peanut butter dog treats with that kind of peanut butter? It's super easy, and the best part is that you can control exactly what's in the peanut butter. You can also ADD really healthy ingredients like flax seed and coconut oil. Of course, not everyone has the time to make their own peanut butter. But the next time you buy peanut butter, take a minute to look at the ingredient list. A dog friendly peanut butter will not have added salt or sugar, just dry roasted peanuts. Or, you can purchase a peanut butter that is specifically formulated for dogs, like DogsButter. You may find that homemade peanut butter is the only way to go when making your own dog treat recipes. It's also quite tasty (and healthy) for your two-legged family members, too. Of the 15 recipes in my first eBook, 5 of them have Peanut Butter as a main ingredient. There's a training treat, a no bake recipe and a dog-safe rice crispy treat. All of them feature creamy peanut butter. 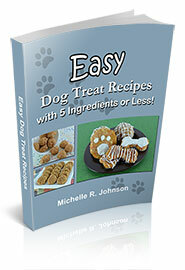 Check out my Easiest dog treat recipes, yet. Read more about all the features, like over 90 original photos, of our first eBook 15 Easy Dog Treat Recipes with 5 Ingredients or Less!. Sharing your life with a dog means you are learning something new almost every day. Sometimes are sweet companions teach us compassion, patience or to simply relax and enjoy a good nap. They can also teach us about nutrition. You want the very best for your dog, so learning about what we feed them is a big part of keeping them healthy and happy. What has your dog taught you? Please share your tips with us so we can help more dogs (and their parents) have a rewarding life together. "[Stores] sell LACTASE enzyme that can be added to address mild lactose intolerance. I add cottage cheese to my dogs diet occasionally, and on general principle I add LACTASE to the cottage cheese to avoid any issues." "I love your dog treat recipes! Thanks so much for pursuing this project – I agree that making your own dog treats is an important strategy for raising a healthy dog!" "Thanks you so much, I'm so glad you have this site, I love your ideas."